Lamp Re-Igniters ensure rapid cold start and hot restart. Rapid Smart Start RSS-50-150 Series speeds starting and re-starting of high-pressure sodium light sources in outdoor areas. Units connect near lamp socket, ensuring illumination of 52/55 V HPS lamps between 50-150 W. They consume less than .3% of power during normal lamp operation and withstand moderate under- or over-voltages. Re-igniters are suited for pole- and building-mounted commercial and light industrial applications, such as parking lots, building entryways, and sidewalks. Elmhurst, IL 2006 - Thomas Research Products, the long-established OEM supplier of advanced-design electronic control devices for H.I.D., fluorescent and incandescent light sources, a division of Varon Lighting, Inc., has introduced lower-cost versions of the company's famous RSS-50-150 Rapid Smart Start. RSS is a series of rapid re-ignitors for use in the popular range of most high-pressure sodium lamp outdoor light fixtures. New Products: RSS-50-150 Low Cost Rapid Smart Start series lamp re-ignitors, for faster starting and restarting of high-pressure sodium light sources in outdoor area lightings parking garage and other commercial fixtures. Design: Thomas Research Products, LLC. Product Applications: RSS-50-150 Low Cost Rapid Smart Start series lamp re-ignitor is a modern electronic device that ensures rapid, reliable, eminently affordable "cold" start, and "hot" restart, of high-pressure sodium lamps in a range of outdoor area pole-and building-mounted commercial and light industrial applications. These include parking lots, building entryways, sidewalks, landscaped grounds and the like. Product Description: RSS-50-150 Low Cost Rapid Smart Start series re-ignitor has a compact cylindrical shape. It is easy to handle and install by OEM assembly-line manufacturers, electrical contractors and maintenance people. RSS connects near the lamp socket, assuring reliable illumination of most 52/55-volt HPS lamps between 50 and 150 watts. RSS minimizes the common problems of expected delays and hesitation, when starting "cold" HPS lamps, or restarting "hot" lamps after momentary power interruptions or variances in line-supply voltage. It allows an even level of illumination to be maintained at all times. This is particularly useful in and around large public buildings and grounds; especially those with substantial pedestrian and vehicular traffic, or with high-security concerns. RSS-50-150 Low Cost Rapid Smart Start series consumes less than .3% of power during normal lamp operation and readily withstands moderate under-or over-voltages. It further prevents the equally troubling and obvious problems from constant recycling of "end-of-life" lamps. Construction & Finishes: RSS-50-150 Low Cost Rapid Smart Start series re-ignitor is UL recognized and CSA certified, designed with a case temperature rating of 105° C. RSS is compatible with most standard HPS lamps of any brand from 50 to 150 watts. Operation is independent of "x3" ballast leads, and convenient for all remote-ballasting applications. Cost Rapid Smart Start series lamp re-ignitor is available by contacting: Thomas Research Products, LLC, 765 S. Route 83, Elmhurst, Illinois 60126. Telephone: (630)532-6500. Fax:(630)532-6501. E-mail: info@thomasresearchproducts.com. Visit Thomas Research Products on the World Wide Web at www.thomasresearchproducts.com. Founded in 1987, Thomas Research Products is an innovative manufacturer of proprietary ignitor turn-off switches for MH and HPS lamps, automatic metal halide cycling switches, relays and wire connectors for the commercial and residential indoor/ outdoor lighting fixtures industry at large. Varon Lighting companies comprise Beacon Products, Inc., Precision Fluorescent, Inc., RSL, LLC (formerly Rockscapes Lighting) and Thomas Research Products, LLC. Information on any Varon Lighting manufacturer and their products may also be obtained from Varon Lighting, Inc., 765 Route 83, Elmhurst, Illinois 60126. Telephone: (630)532-6500. Fax; (630)532-6501. E-mail: varonlighting@aol.com. Visit Varon on the World Wide Web at: www.varonlighting.com. Flare Ignition System offers uninterrupted performance. 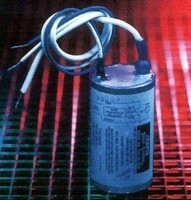 Gas Ignition Control runs on 120 Vac, 50/60 Hz.